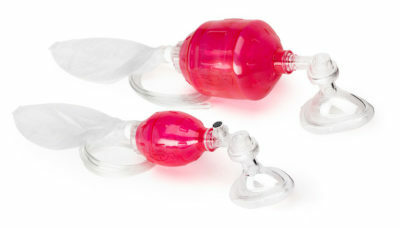 The SMART BAG® MO Silicone Bag-Valve-Mask Resuscitator has been designed for Users who prefer Silicone and its autoclavable features. Provide consistent ventilations while almost completely eliminating the risks associated with conventional BVM ventilation. The unique actuating mechanism hidden inside the neck bushing of the SMART BAG® MO actually responds to the rescuer and the patient. Available in two models (Adult & Child). Transparent Universal Facemask allows for easy monitoring of skin color, signs of vomitus or body fluids. Complete with Oxygen Reservoir System. Includes SMART BAG® MO Adult Silicone Bag-Valve-Mask Resuscitator c/w Universal Resuscitation Mask and Oxygen Reservoir System. The SMART BAG® MO is equipped with a Manual Override control to disable the action of the SMART Valve. Current research indicates that, for all patient conditions, the Manual Override control should NOT be used and the “SMART VALVE” should be left in the “Enabled” position. This recommendation maintains operation of the device in strict compliance with the current Guidelines for CPR and ECC as published by the American Heart Association and European Resuscitation Council. Transparent Facemask allows for easy monitoring of skin color, signs of vomitus or body fluids. Reduced Risk of Gastric Insufflation.